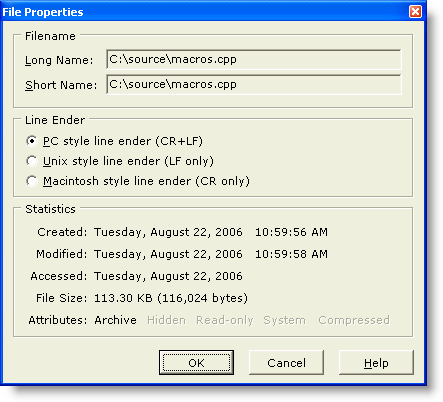 The File Properties command displays a dialog box containing information about the file on disk which is associated with the editor's current file. The file's long and short names, create/modify/access times, file size and file attributes are all displayed. Because this command reports information about the current file's disk file, it will be disabled when editing a file which has yet to be written to disk. Use this option to save files with a PC style line ender (CR+LF). Use this option to save files with a Unix style line ender (LF only). Use this option to save files with a Macintosh style line ender (CR only). Boxer can read files with any type of line ender, and it will make note of the line ender as the file is read. The above options can be used to force a file to be written with a specific line ender. The Long Name and Short Name properties are displayed in read-only edit boxes to permit the strings to be copied to the Windows clipboard, if desired.